Ben Gibson and Patrick Mulligan’s chart illustrates the go-to cocktails of 49 movie and book characters. You were probably never quizzed in English class on fictional protagonists' best-loved adult beverages. Ben Gibson and Patrick Mulligan's illustrated chart is your remedial education on that topic. 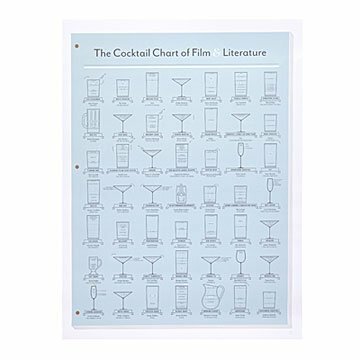 The catalog of 49 drinks take you on a journey through the libations of your favorite movie and book characters. Which British Secret Service agent insisted that his Vesper Martinis be shaken, not stirred? What wealthy, party-giving, unrequited Long Island lover drank Gin Rickeys? Who was the Manolo-wearing Manhattan she-scribe who favored Cosmopolitans? All (including recipes) are revealed here, in a poster designed to look like an movie script (for building boffo beverages, old sport). Your proverbial dog will never eat this homework. Designed and made in Brooklyn, New York.